Lauren London is still grieving the loss of the love of her life, Nipsey Hussle, but she’s honoring him in a way to make sure that he is always with her. 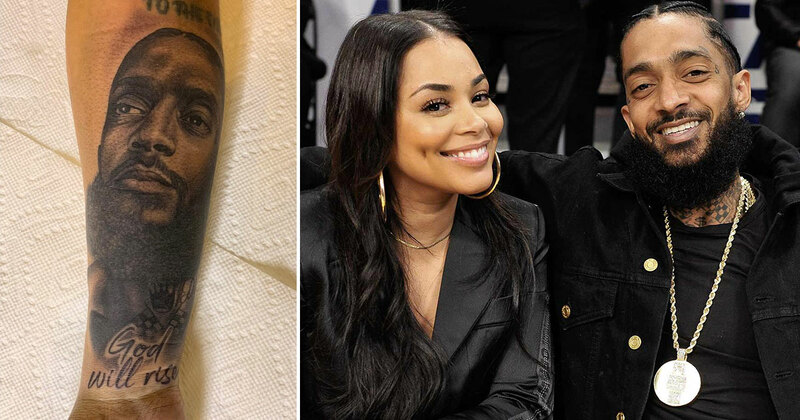 Shortly after giving an emotional and touching speech at Hussle’s “Celebration of Life” memorial service, London unveiled a new forearm tattoo of late boyfriend’s face. Nipsey Hussle, a Grammy-nominated artist, community activist, and philanthropist, was shot outside of his LA clothing store on March 31st. He and London had been dating since 2013 and share a 2-year-old son, Kross. 21,000 people gathered at the Staples Center on Thursday (Apr. 11) to celebrate Hussle’s life. London is not the only person to pay tribute to Hussle with a tattoo. NBA player J.R. Smith and close friend The Game both got fresh tattoos to honor Hussle after his passing.